well, dear cookie lovers, these oatmeal cookies are utter perfection. 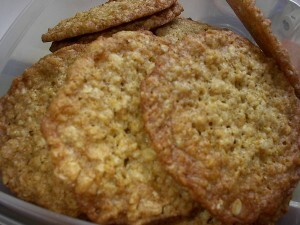 if you are a thin and crispy oatmeal cookie lover, these are for you! and if you are like me and prefer your cookies soft and chewy, well, these are still for you! i have never had a more delicious crunchy cookie overtake my desire for soft and chewy until now. why not try a batch to include with this year’s thanksgiving desserts — they really are quite something! and they travel well too, if they are well-wrapped! send off some to your favorite oatmeal cookie lover! this cookie was featured in the january – february, 2008 issue of cook’s illustrated, which beyond a doubt is one of the best food-related magazines on the market today. that they do all the research for us is just one of their outstanding attributes — their true appeal is that they provide excellent recipes for food real people eat! if you haven’t read an issue recently, perhaps you should ask santa to bring you a subscription! 1. adjust oven rack to middle position and heat oven to 350 degrees. line 3 large (18- by 12- inch) baking sheets with parchment paper. Whisk flour, baking powder, baking soda and salt in a medium bowl. 2. in standing mixer fitted with paddle attachment, beat butter and sugars at medium-low speed until just combined, about 20 seconds. increase speed to medium and continue to beat until light and fluffy, about 1 minute longer. scrape down bowl with rubber spatula. add egg and vanilla and beat on medium-low until fully incorporated, about 30 seconds. scrape down bowl again. with mixer running at low speed, add flour mixture until just incorporated and smooth, 10 seconds. with mixer still running on low, gradually add oats and mix until well-incorporated, 20 seconds. give dough final stir with rubber spatula to ensure that no flour pockets remain and ingredients are evenly distributed. 3. divide dough into 24 equal portions, each about 2 tablespoons (or use a #30 cookie scoop), then roll between palms into balls. place cookies on prepared baking sheets, spacing them about 2 1/2 inches apart, 8 dough balls per sheet. ssing fingertips, gently press each dough ball to 3/4-inch thickness. 4. bake 1 sheet at a time until cookies are deep golden brown, edges are crisp, and centers yield to slight pressure when pressed, 13 – 16 minutes, rotating baking sheet halfway through. transfer baking sheet to wire rack; cool cookies completely on sheet.